Last edited by rssszl1; 02-05-2019 at 07:33 PM. Why is your IROC #1 of 1 rare? so whats your actually asking price it's 12000 here and 9999 on your craigslist post? TRY TO FIND ONE.I HAVE OWNED THE CAR FOR 15 YEARS AND CAN FIND 1# LIKE IT.IF ANY ONE CAN FIND 1# I WOULD LIKE SEE IT!!!! So you cannont verify it is a 1 or 1 vehicle? You just think it is because you have never seen another like it? Is that why you are asking $12,000 for the vehicle? 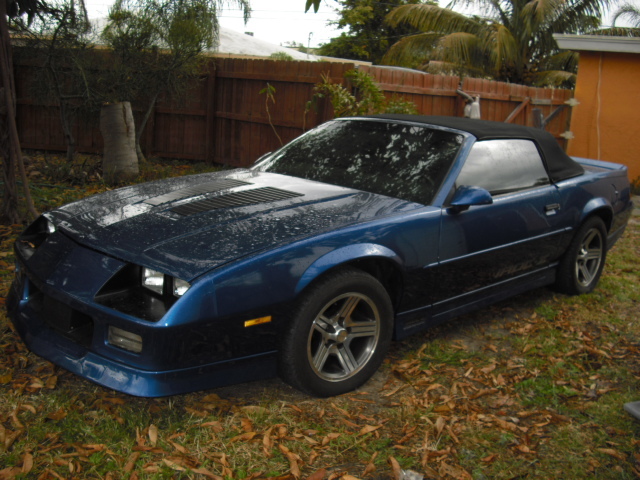 I am just curious because I just bought a 1991 Z28 Vert that is metallic blue with leather and 37,000 original miles for $5000. Last edited by 67tothefuture; 04-12-2009 at 06:07 PM. Sigh. I have deleted posts against the rules. No more posts about the money the seller is asking. It has already been established above that the car is NOT 1 of 1, so no more of that either. The seller has the right to ask any price he or she wants and even to ask one price at one place and another price at another place. Since everything has been covered, there should be no more posts in this thread/ad unless you want to buy it or unless you want to negotiate...otherwise leave the ad and proceed to the next. (It has already been established above that the car is NOT 1 of 1.) What is a established above? Does anybody in 3rd gen have 1 like it? Its only blue,auto and leather.If you THINK its not 1of1, is it 1of2-1of3-1of4-1of5. I have the car to prove it, what kind of proof do you have that the car is not 1 of 1? Wow, it really wasn't worth helping you out from yourself. My mistake. Last edited by 92 Formula; 05-04-2009 at 07:41 AM. I read through the threads...dunno what is going on, don't care, but i am interested in your car. Have you had any offers? I think some collector secretly stashed the other few hundred or so clones of your car away in his garage, just to fool you. Can we get some better quality photos? Maybe some of this 1 of 1 leather interior, or the 1 of 1 meticulously maintained "100%" 120,000 mile paint? Or what about the engine? Seriously, I would love to have the car, but am not in the market. 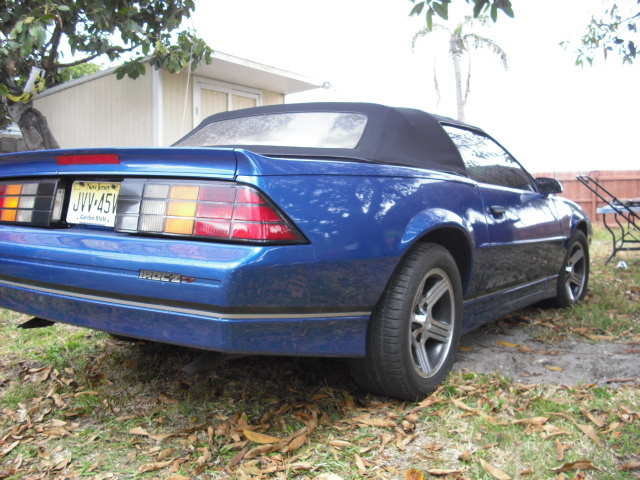 I'd like to have another blue metallic convertible, even though the car isn't as rare as you think. 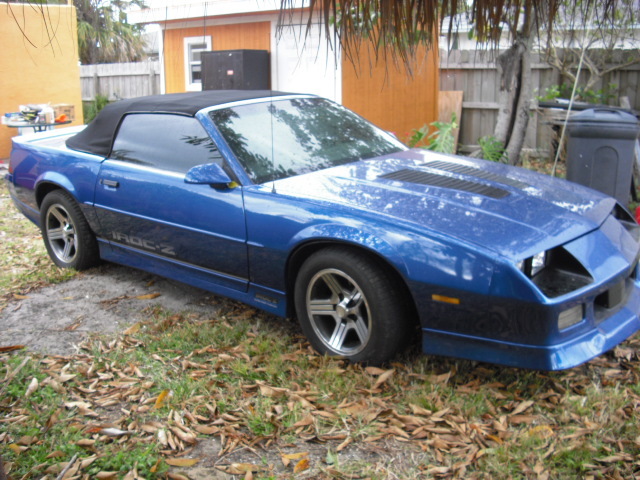 And on a side note, I've never seen another Ultra Blue Metallic '91 Z28 convertible with the FE3 suspension code, dove grey leather interior, and an automatic, with no cd player, and all power options, but that doesn't mean it's in fact 1 of 1. I bet there's a few just like mine (like the guy who posted a few above me) that has the same exact car. But I've never seen one with my own eyes, so it's GOT TO BE 1 OF 1! And also why do the plates say New Jersey and you have it listed as Florida? You are aware this thread is 10 years old, correct ?? I am, but the OP just posted an hour ago. It’s like, the only blue Vert with leather or something for 1990? Maybe.. They barely made any Verts that year.. that’s not rare enough for you? My car is 1 of 1 based on the VIN plate.. So. I want to make sure I'm correct. The car has been for sale for 10 years. It was $9999, then 12k, now 18k? I'm still unclear on why it is 1 of 1. Is it because the leather, color, cigarette lighter delete, or what? Besides, being 1 of 1 because of some obscure RPO or such doesn't make it desirable. Seriously, how many Iron Dukes are out there? Not many, but they aren't valuable because nobody wants them. true, but it’s obnoxious at car shows and cruise nights how people try to pull the whole.. “My car is 1 of 15 with black interior and no rear defrost!” Cool, but they made 25,000 that look just like it too.. Even worse when a seller tries to use that tactic.. come on! Well I'm not sure if anyone has been looking for 10 years to find one, but if so you should sell it IMMEDIATELY. So, if memory serves me right, I think there were only like 1,400 convertible IROC's built in 1990. What makes this car 1 of 1? Can you please explain? I used to own a 1999 Hugger Orange Camaro SS Convertible that was 1 of 18 with white leather, white top, and white stripes......but I HAD PROOF from SLP as to how many there were. They did not know how many of the 18 were automatics/6 speeds, etc. Claiming 1 of 1 will not do a thing for you without proof. Please tell us. The way it looks to us is that a 1 of 1 car would not take 10 years to sell. FWIW, my 1 of 18 car sold IMMEDIATELY, and to an out of state guy that drove hours to come get it. All you have to do is prove it.......and you'll more than likely get some interest. Either way it's a cool car. What happened to the front of the car? I see the front hood gap is too wide, the pass side inner fender liner is loose, and the stripes are missing from the entire front of the car? Last edited by dagwood; 02-07-2019 at 07:08 PM. The fact that the only pictures provided show this thing sitting in a bum *** backyard, parked on the grass with dead leaves everywhere on a cloudy day... makes it even funnier. LOL GLWS. At the end of the day, it's a free country and you can claim whatever you want. ....for it to be credible, the burden of proof is on the person making the claim. It's that always been that way. It may be 1 of 1, but if you can't prove it beyond a reasonable doubt, it doesn't count. .....You'd be better off saying you've been looking for another one like this one for years and never seen one. That sounds realistic. ....anyone who would pay more for 1 of 1 is immediately going to want you to verify. That being said....it seems to be a nice car. I don't personally care for 90's Iroc dash, but it's certainly a sharp car. For $18k, though, you need more quality pictures if you expect that kind of money. Those pics might sell a $4k dollar Accord, but not a 30 year old Camaro. -and I like the car....I'm on your side. -need mo better pics.